Stephen F. Austin State University's dance program will showcase the Repertory Dance Company in concert during its production of Everything and Nothing … etc., which premieres at 7 p.m. Feb. 14 in the Cole Concert Hall on the university's campus. NACOGDOCHES, Texas - Stephen F. Austin State University's dance program will showcase the Repertory Dance Company in concert during its production of Everything and Nothing … etc., which premieres at 7 p.m. Feb. 14 in the Cole Concert Hall on the university's campus. Additional showings are scheduled for 7 p.m. Feb. 15 and 3 p.m. Feb. 16. Admission is free for SFA students, and students outside of SFA may attend for $8. Tickets are $10 for faculty, staff and senior citizens, and $12 for general admission. Tickets can be purchased at the door. 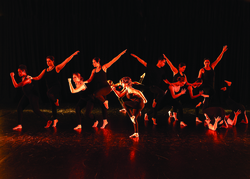 The production will feature works by guest artists and SFA faculty members from the dance program. The Alief Jazz Ballet Company, which is under the direction of alumna Kelsey Key, will perform, marking the first time alumni from the SFA dance program have performed alongside the Repertory Dance Company. "I love the content of this concert. It's diverse and exciting, and I feel the students really enjoy the work they are performing," said Heather Samuelson, dance program co-coordinator and assistant professor. "Our guest artists and faculty members have really sparked intrigue and a sense of creativity into our dancers and it shows through their dancing." The concert will feature a variety of dance styles and will showcase pieces covering topics such as friendships and unfinished relationships, corporate America, self-image, and self-love.